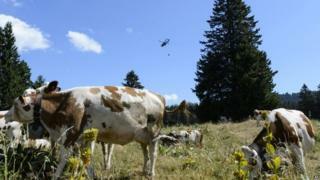 Swiss army helicopters have crossed the French border to scoop up lake water to help thirsty cows, drawing criticism from French officials, it has emerged. The operation last week at the Rousses Lake in the Jura mountains caught French officials by surprise. They said the mission was not authorised. Swiss media said the country's army had asked for permission from the French air force - not local authorities. The water was needed to save the cows from dehydration during a heat wave. Christophe Mathez, deputy mayor of France's Les Rousses commune, said local officials had "no idea this operation would occur", the Associated Press news agency reports. However, Swiss military official Denis Froidevaux told the Swiss newspaper Le Matin: "As soon as they contacted us, we realised there was a communication problem and we immediately stopped." The Swiss air operation also startled local residents and tourists swimming in the lake, reports say.